Floods and Elections: How Lasting is Voter Gratitude for Disaster Relief Spending? The recent flood in Poland has taken a heavy toll. More than 14 people have been killed and thousands evacuated. The damage from the Oder flood is estimated to exceed $2.5 billion. The Polish government has already promised to disburse $46 million to people in the most heavily affected regions, about $1,800 per household. Such disaster relief provided by the government is clearly vital to help those affected by the flood. But do affected citizens electorally reward such rapid policy responses to natural disasters and how long will their gratitude last? Jens Hainmueller (MIT) and I address this question in a study that exploits the 2002 Elbe flooding in Germany as a natural experiment to estimate the short- and long-term electoral returns to disaster relief. Given the well known “peak-and-end” rule for forming retrospective judgments, the 2002 Elbe flooding provides an ideal case to establish an upper bound for the longevity of voter gratitude, as the incumbent’s policy response to the flood was both “peak” and “end” — it was massive and occurred immediately prior to a federal election. 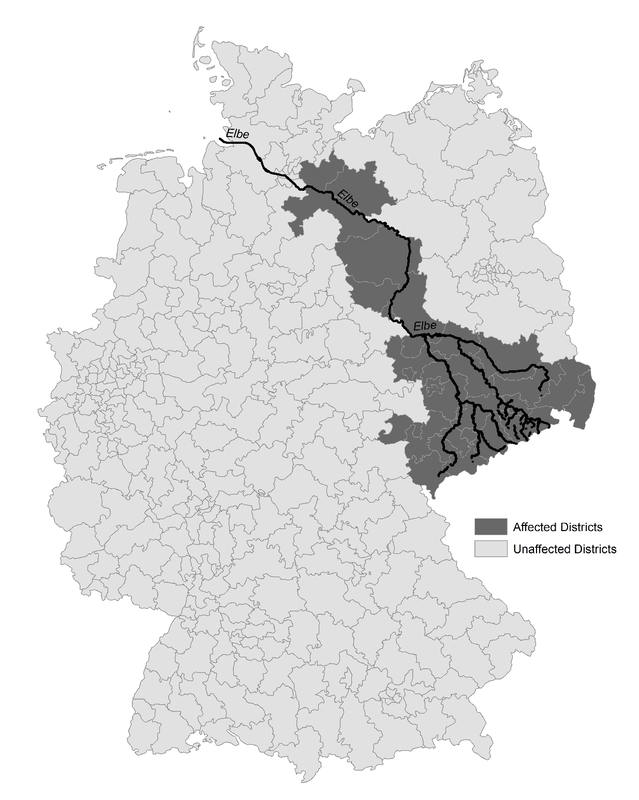 The 2002 Elbe flooding affected large parts of East Germany. From a hydrological perspective, floods with such severity occur only once every 500 to 1,000 years. The German government reacted swiftly. 45,000 soldiers were sent to the affected regions to stabilize dams, evacuate people in danger, and coordinate the disaster response. In addition, Chancellor Schöder quickly announced an emergency program that provided €385 million disaster relief aid. Moreover, the incumbent SPD-Greens coalition introduced a “Flood victims solidarity” bill backed up by a €7.1 billion disaster relief fund, the largest amount ever spent in the context of a natural disaster in German history. We find that the flood response resulted in an immediate electoral gain for the Social Democrats (SPD), the major incumbent party, of about 7 percentage points in affected areas in the 2002 election. We also find that about 25 percent of this short-term return carried over to the 2005 election and that the electoral gains vanished entirely by 2009. Our estimates imply that the SPD government paid about €63,000 per additional vote in the affected regions in the 2002 election. The price per vote drops to about €49,000 if we take the long-term electoral return to disaster relief into account. Overall the results suggest that even though electoral returns to beneficial policy decay over time, policymakers can, at least given very favorable circumstances, generate voter gratitude that persists several years — perhaps longer than scholarship has acknowledged so far. At the same time policymakers should not expect to earn much credit among voters for policies that date back more than a few years. Electoral accountability alone may therefore be ill-suited to properly incentivize policymakers to seek appropriate long-term policy solutions to fundamental economic, financial, and environmental problems, because voter gratitude is too short-lived. This entry was posted in Causal inference, Research by Michael M. Bechtel. Bookmark the permalink. I thought this was a great paper, and addressed all the (obviously predictable) concerns I had before reading. I had a question though about the notional cost-per-vote figures. I wonder how helpful they are. Here, you have one treatment, which is the conjunction of flood + relief spending. But if there had been a flood, and either no relief spending or a derisory level of relief spending, parties in the government might have actually lost votes. So, the first euro of relief spending goes on winning back voters, not persuading new ones and thus, the cost per vote should, if anything, be even lower. Does that reasoning make sense? Thanks for this comment! We fully agree that the flood and the response together constitute the treatment. So the vote share of the incumbent party in the directly affected districts increased by about 7 percentage points on average compared to what it had received in the absence of the flood and its policy response. We cannot estimate the whole electoral reward-to-spending response function as that would require for example precinct-level spending data. Interestingly, Jowei Chen’s results on how Federal Emergency Management Agency (FEMA) aid in the aftermath of the summer 2004 Florida hurricane season affected the 2004 presidential election results indiciate that for per capita FEMA aid below about $50 Bush actually experienced losses even in Republican precincts (see figure 2 on p. 32 of his paper). That is in line with what you suggest. The reward-to-spending response function, however, looks pretty linear. Whether the first per capita Euro spent on relief won back former SPD voters or convinced other citizens in our application is something which is difficult to address with the kind of data we have. What we can do, however, is to examine whether the policy response by the incumbent generated different electoral returns across different SPD vote share quantiles. The evidence suggests that this was the case, with the policy response being more effective at lower quantiles.